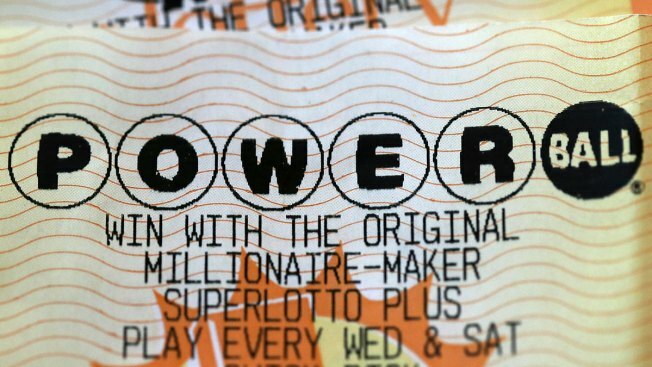 This Jan. 3, 2018, file photo shows a Powerball lottery ticket in San Anselmo, California. Two tickets were sold that match the winning numbers drawn for Powerball's $688 million jackpot, one in a rural Iowa town and the other in New York City, lottery officials said Sunday. Powerball officials said the tickets matched all six numbers in Saturday night's drawing and will split the fourth-largest lottery grand prize in U.S. history. The jackpot was originally estimated at $750 million but worked out to $687.8 million by the time of the drawing. One of the winning tickets was sold at Casey's convenience store in Redfield, Iowa, a rural community of about 800 people roughly 35 miles (56 kilometers) west of Des Moines. The other winning ticket was sold at West Harlem Deli in New York City. There was no immediate word on who purchased the winning tickets. The winning numbers were 8, 12, 13, 19 and 27, and Powerball 4. The drawing came four days after someone won a $1.54 billion Mega Millions jackpot, which marked the second-largest lottery prize. That ticket was sold in South Carolina. Powerball is played in 44 states, Washington, D.C., the U.S Virgin Islands and Puerto Rico. The odds of winning the jackpot are 1 in 292.2 million. The exact jackpot is determined by sales figures where tickets are sold. Officials note that the reason jackpots grow so dramatically when prizes get enormous is because people who don't normally play decide to buy a few tickets. That's great for lottery sales but makes it more difficult for officials to estimate how many irregular players will participate and how many tickets they'll buy, adding further complications to the jackpot estimate.